Leon Allen White, better known by his ring name Vader or Big Van Vader, is a semi-retired professional wrestler, actor, and former professional football player. He most notably performed for World Championship Wrestling (WCW) & the World Wrestling Federation (WWF - now known as the WWE, World Wrestling Entertainment) during the 1990s and 2000s. White is widely regarded as one of the greatest super heavyweight wrestlers ever. White performed as a monstrous wrestler capable of aerial maneuvers such as the Vadersault, which was voted as the "Best Wrestling Maneuver" for 1993 by Wrestling Observer readers. Among other accolades in WCW, he won the IWGP Heavyweight Championship and the WCW World Heavyweight Championship three times each, the Triple Crown Heavyweight Championship twice, the WCW United States Heavyweight Championship once, and won the battle royal main event of the 1993 Battlebowl pay-per-view. 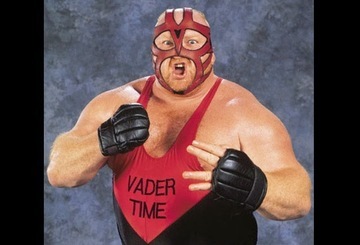 Vader was inducted into the Wrestling Observer Newsletter Hall of Fame in 1996. White was a nationally ranked center who was recruited by forty colleges. He played offensive line at the University of Colorado, where he became a two-time All-American and earned a business administration degree. In the 1978 NFL Draft, White was drafted as a center by the Los Angeles Rams with the 24th pick of the 3rd Round (80th overall). During White's first season, he was put on the injured reserve list, but in his second season, he played in Super Bowl XIV against the Pittsburgh Steelers. He was forced to retire after only a couple of seasons due to a ruptured patella.